England forward Maro Itoje will miss the Six Nations matches against France and Wales with a knee injury. The 24-year-old Saracens lock suffered medial ligament damage during England's 32-20 win over Ireland in Dublin on Saturday. Itoje is expected to be out for two to four weeks, but will stay with the squad and could return for the final two matches of the championship. Fellow Saracen Nick Isiekwe has been called into the squad as cover. Wasps' Joe Launchbury is favourite to be drafted into the matchday squad for the game against France at Twickenham on Sunday, with Courtney Lawes stepping up from the replacements after coming on against Ireland. "He's a brilliant player and he's a world-class player," England scrum-half Danny Care, who missed out on selection for Eddie Jones' squad, told Rugby Union Weekly. "He's a guy who gives you an unbelievable amount of energy every defensive and attacking play, he's in your face, he's someone teams do not want to play against. "He's a big loss for England. I hope he's back as soon as possible but there will be other players who can step up to the plate." 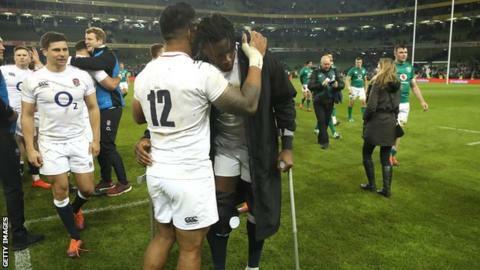 Itoje chipped a bone in his knee on England duty in November but played in all four autumn Tests. England are level on points with Scotland at the top of the Six Nations table after claiming a four-try bonus-point victory in their opening match.